HE WAS ALL of 11 years-old, this scruffy urchin with seashade eyes and a smile as big as the blazing sun. "This," he said, offering us a suspiciously shiny coin, "is 2,000 years old. Very, very old. Worth very very much money. For you, I give it for only 20 US dollars". We counter-offered $5, knowing that had the currency been genuine we would have been hanged, drawn and quartered if we attempted to take it out of Turkey. (Turkish police have serious punishments for smugglers of antiquities). "What?" said our urchin. "It costs us more than your miserable five dollars to make this genuine article." Negotiations concluded immediately, with the small boy laughing like a drain when he realised what he had said. Instead of coins, we settled for a helping hand mooring our yacht to a pine tree, a task for which he refused a tip of any kind. 'This boating is my job for which my master pays me," he explained. "The coins are my mere sideline." It's this fine distinction between extortion and help which makes Turkey such a magic destination. The locals will seek profit where they can but, on the other hand, are among the most helpful, generous people on earth. Sailing the Dalmatian Coast of Croatia has been the yachtie trip of choice for a few years now but The Luxury Travel Bible predicts a revival in the trendiness of Turkey. We had chartered a boat out of Marmaris, on the south-eastern coastline where the Aegean meets the Mediterranean. It's a place of great beauty and, provided you survive the hair-raising midnight ride from Dalaman airport an hour away from Marmaris, it can be the most rewarding holiday ever. Our taxi ride, taken at approximately 68 miles per hour (110 kilometres per hour) through a nightscape of brooding, pine-clad mountains and a star-filled, dark blue sky, offered a spectacular contrast to the languid days which followed. At one stage we met a driver full pelt on the wrong side of the road. "Arak," said our driver, raising his elbow in a pantomime of drinking, before taking to the roadside gutter where we narrowly avoided a lean hound and a pair of courting adolescents. "Arak is good for the heart. Bad for the nerves." We agreed. Marmaris is a charming coastal town with a massive marina, terrific bayside restaurants serving fish and kebabs, good Turkish bread, sharp local wines and, of course, the ubiquitous arak. It also has great night life when the youthful crews on yachts from all over the world gather at discos on Friday nights. Our hotel was right next door to one, but we were so adrenalin-charged after our drive, it didn't really matter. Lying on our narrow pnests' beds, with starched cotton sheets, an evil eye hanging on the wall to ward off the dangers of the night, we thought we'd died and gone to heaven, even if it was a noisy one. We boarded our yacht next morning at the marina, a mere 1640 feet (500 metres) from the hotel. It proved to be easy-to-sail, responsive yacht which could sleep eight, but which was comfortably handled by the four of us, three of whom were experienced sailors. (In truth, I hardly had to do anything as the weather was far and the two hirsute Captain Blighs on board managed everything between their eager selves). The yacht was fully equipped. All we had to do was organise food and drinks from the local stores whose staff bicycled our goodies down to the quay for us. There was great storage on board, a fridge which worked like a dream if you topped it up with ice when the generator is off, good heads, a shower and a ladder on the stern for hosing off after a salty dip in the indigo waters of the coast. Everything we could want was at our fingertips in the well set up galley, and the lockers were stocked with linen and towels. It remains one of life's minor MYSTERIES as to how the ancients managed to carve them on such SHEER, STEEP surfaces. If you've never sailed before, you can charter a yacht with a skipper and crew, or just a skipper until you become confident. You can also join a flotilla of yachts which follow an experienced leader, sailing as a group. Or you can rent a cabin on a 'gullet', the more traditional high-wooded Turkish yacht which is air-conditioned and fully staffed by cooks and waiters who take great delight in seeing how much arak they can pour down your throat. 'Gullet' are favoured by partying young Europeans and Scandinavians, who have earned the name of "Ja-hoos". Great sport unless you are moored alongside them in a tranquil cove. 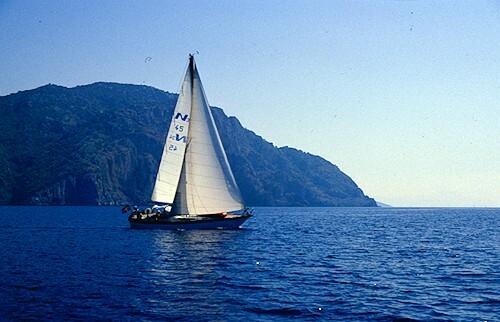 Tranquil coves are what sailing coastal Turkey is all about. We sailed east from Marmaris down to the Gulf of Fethiye -- a week there and back. Our destination was Ekincik, a wide, deep bay with many little inlets where one can safely moor. Here we found a number of good simple restaurants -- choosing one was hard. We ended up in a flowery courtyard eating fish, fetta, fat red tomatoes dressed with olives and oil, followed by striped tiger melons and rice pudding. A gaggle of smiling, moustached brothers dashed about in wide Turkish trousers and shirts so starched and white they matched their teeth. It's one of life's great indulgences to wake in a golden dawn, walk to the stern of a yacht and dive off into waters so clear that you can see the white sand 15 metres below. Esther Williams -- eat your heart out. At Ekincik, burly lads will potter alongside in painted flat-bottomed boats to suggest a daylong trip up the Dalyan River -- a trip well worth taking. The Dalyan River (where many of the grassy, marshy scenes in The African Queen were filmed) is shallow, so your yacht can't make it up river to the spectacular ruins of Caunus. Around 400 BC, Caunus was an important Carian city and its bathhouse, fountains and huge amphitheatre remain as testimony to the town's importance. Your boat will drop you at a quay, then you scramble up like a mountain goat to the ruins (wear decent walking shoes) before returning to Dalyan itself for a feast in the sunshine by the river, a feast of baked fish and meze, a collection of starters very big on yoghurt and eggplant, all washed down with good Turkish wine. If you can bear to raise your eyes from the delicious food, you'll see lots of rock tombs carved into the massive cliffs which soar to the sky right above you. It remains one of life's minor mysteries as to how the ancients managed to carve them on such sheer, steep surfaces. From Ekincik, we sailed into the Gulf of Fethiye itself, spending the days swimming and snorkelling in the blissful coves of the islands which dot the gulf, going ashore in the evenings for more good food at the tiny restaurants which edge the water. There's always a place to eat. One especially attractive mooring is at Cleopatra's Bay, where madam herself is said to have swum. Like so much of this part of the Mediterranean it, too, has its own antiquities, a huddle of crumbling towers and looming walls to which you can swim from your yacht. Turkey actually has more antiquities than Greece, and many celebrated archaeological sites are accessible from the water. If blue skies, clear waters and golden sunlight leave you wanting, shore excursions are a happy alternative. Each evening as you come to a sheltered mooring, a lad will usually appear in an inflatable. Not only will he help you moor, taking your landline to the rocky shores whose pine trees make a perfect place to wrap your line around, he'll also take your booking for the evening meal at the local cafe, and tell you how to organise a shore excursion. There's always someone to help you if you are out of your depth (literally), or a smiling lad to produce mineral water if you need it. Even small towns have fresh water and fuel, and the locals are likely to give you a small blue evil eye to protect you on your voyage. Sailing off Turkey approaches Paradise so we felt rather bereft when we found ourselves back in Istanbul with its blue-hazed mosques, busy markets, battered romantic ferry rides to the mouth of the Black Sea, and the magic of breakfasting in Europe, lunching in Asia. The indulgent delights of the Ciragan Palace Kempinski Hotel (The Luxury Travel Bible recommends one of the 11 suites in the old palace itself) situated on the shores of the Bosphorus proved some consolation, but we ached for the seas of the coast. We sailed mid-September, and the weather proved perfect. Conditions were light, however, the motor was reliablefor windless mornings. The breeze came up mid-afternoon. Take casual clothes, rubber or rope-soled shoes and plenty of sunscreen. Radio communication ensures that any hassles can be sorted out with the yachting base in Marmaris. Good yacht agents will send mechanics or skippers if you lose your confidence, and additional crew if you need them.